PART 1: Honestly, I could probably eat cereal for dinner every single night and be okay with it. I’m really not a dinner person. Brunch, however, now that’s where it’s at for me. So cereal and maybe the occasional tacos could really get me thru most weeknights. PART 2: I have this family who wants, like, actual dinner. Especially my husband. And I do think it’s nice to sit down at the dinner table as a family and talk about our days and instill that habit in our daughter now so she’s not dining and dashing every night when she’s a pre-teen. I just don’t care what we eat. PART 3: It costs me more money than I like to admit every time I go to the store. I buy organic, local, and free-range and it has an impact on the ol’ pocketbook. Good for me? Yes. Good for the bank account? No. So I avoid going to the store as much as possible. I hear you. And the solution to my dinner dilemma is actually a solution you can pull into your business right now. In fact, my problem solving prowess is going to save you time, money, and headache….. faster than you can order takeout. Ready? Don’t go to the store. Don’t pull out fancy recipe books and dream up your culinary creations. The solution to a dinner dilemma you can pull into your business right now. I know it works because I implement it daily in the kitchen and in business. A big pile of slightly old kale cooked down in some olive oil and garlic + a can of salmon mixed up with a can of chickpeas + 2 fried eggs + some toast = one delicious dinner. And the same thing can be said for your business systems. If you are like most savvy business owners, you do your research and keep up on what’s going on around you. You see and hear about tools and programs others are using to get their business systems in order and they are having incredible success. It’s so exciting, in fact, that you want to get those tools and programs too! I’m launching an e-course so I need to get everything moved over to Simplero/Wishlist Member/Zippy Courses. I’ve used Hootsuite to manage my social media for the last year. Now I see all of these people loving something called Edgar. I want to switch. All of my documents are in Google Drive but I want to move them all over to Dropbox. That’s how my mentor has her files stored and I want to copy her model. Here’s my secret: I LOVE new products, programs, and tools as much as the next biz woman. In fact, it’s part of my work to keep up to date on them (so I know how to help you!) So, believe me, I’m familiar with Shiny Object Syndrome. And I know that it’s easy to get swept up in the ways of others (especially those we admire) and want to replicate what they’ve got going on. I mean, clearly it’s working for them! But often times moving things around simply creates more busy work and less money-making work. And I want you to be money-making. When these thoughts start circling in conversations with my clients, I often give them a simple response: It’s Not (all that) Complicated. I want to be money making! Here’s how it’s just not complicated. Take what you have. Lay it all out. Does it work? Is it sustainable? Do you need the change now or do you want to come back to that in 6 months? A year? Two years? Using what you have already is a powerful solution. 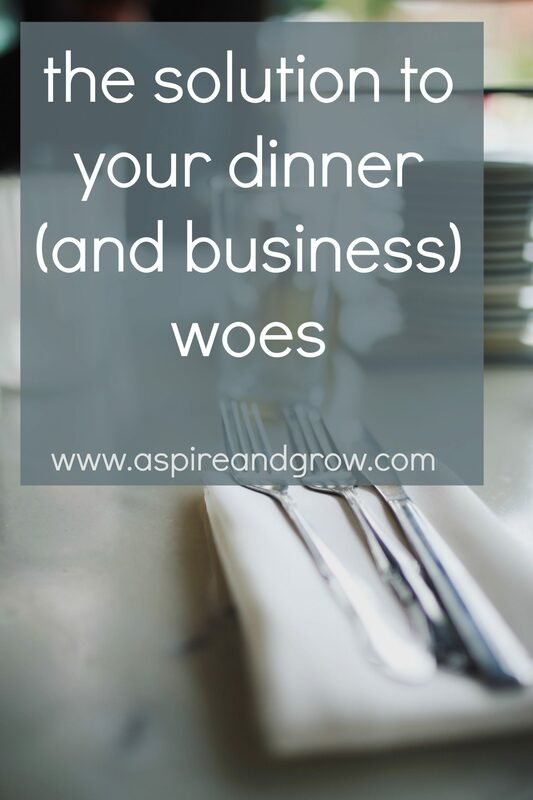 For dinner dilemmas AND for your biz.